I was given the honor recently to sit on a committee that selects scholarships for high school seniors looking for funding to help pay for college. One of the requirements for the application is to complete an essay asking “what goals have you set for yourself and how do you plan to achieve these goals.” While making my way through over 50 essays, I was sparked to write a blog post this week on goal setting in hopes of sparking some near-future list crafting of goals. Enjoy! Goal setting is a topic I think is so great because it is a great exercise for personal development, achievement and fulfillment. I believe through setting and working to achieve goals, we are able to self monitor where we stand in our life journeys, and we are able to actively participate in decision making and choices (both personal and professional). I have always considered myself very goal oriented. I think part of it comes from the fact that I internalize everything and my brain is always moving (not always a good thing). For me, setting goals has been a great way to focus my energies when thinking about things such as: what do I want to be when I’m older, how do I want to be remembered and thought of by others, what interests me, and what would make me happy. Personally, I have a running internal list of goals in my head but I also keep a written list of short term goals in a planner of mine to help keep me on track of things I’d like to accomplish soon. I try to spend time periodically to check in with myself to see where I stand with goals: have I achieved them, have my goals shifted at all, and whether I may want something new for myself and to set new goals. Webster Dictionary defines goals as something that you are trying to do or achieve, and the end toward which effort is directed. Synonyms of a goals are: ambition, dream, idea, meaning, purpose (and the list goes on). I mention the definition and synonyms because they help put in perspective the importance of setting goals in order to live happy lives and spark personal development. There are both short term and long term goals. Short term goals are something that can be achieved fairly easily (such as I have a goal to go to Disneyland this summer or I have a goal to write a thank you note once a week), while long term goals are something to reach for and methodically plan towards (I want to get a graduate degree and have a family). I was given the opportunity a few months ago to instruct a class of 5th grade girls on self-esteem and decision making. One of the topics discussed that day was goal setting. I found it interesting that pretty much every girl knew what self-esteem is, could list what they like about themselves, and talk about ideal characteristics and attributes a successful and likable person possesses. What I found alarming was that most of the attendees had a hard time expressing goals, knowing the difference between short and long term goals, and setting goals that would make them happy. The girls had a hard time putting pen to paper to express what they wanted to achieve. Although I was disappointed to see that we had some work to do that day, I was empowered because we were able to have a great conversation about the importance of goals and relevance of the goal setting process, or rather the importance of establishing S.M.A.R.T. Goals. S.M.A.R.T. goals are goals that are defined as specific, measurable, achievable, realistic and relevant, and time- based. Please see below for more of a breakdown of S.M.A.R.T. Goals. Specific- Which, what, who when where why, and what should be realized? Should be simply written and clear. Measurable- How much or how many? How will you measure this? When they can be measured it becomes clear whether you have accomplished the goal. Attainable & Achievable – Is it feasible? Do we have control over this? Goals should be achievable; they should stretch you slightly so you feel challenged, but defined well enough so that you can achieve them. Realistic & Relevant- Is this goal relevant to my life? To be realistic, a goal must represent an objective toward which you are both willing and able to work. The process of setting S.M.A.R.T. goals was created to help provide the necessary questions to keep in mind when setting goals. They help in setting goals that can be attainable and relevant (the best thing about it is that they are personal and cater to who you are and what you need and want). 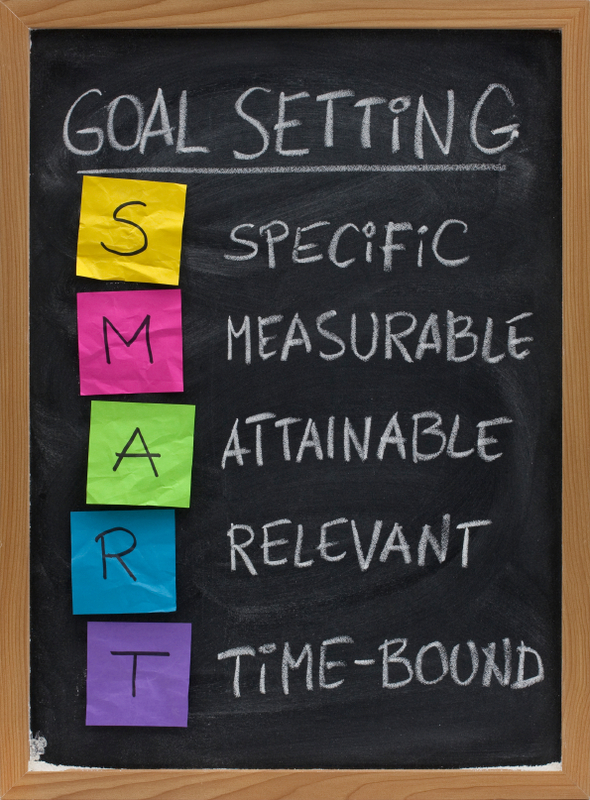 Although I have considered myself goal oriented for years, the idea of S.M.A.R.T. goals is new to me as well. I love what it offers and I love the methodology it provides for people to really think about what it is that would make them happy and feel accomplished. The high school essays I have been reading have got me thinking and reevaluating where I stand with my own goals. I have an exercise for each of us. Take a moment to think of 3 short term goals that you have and 3 long term goals. I encourage you to write these down on a piece of paper and use the S.M.A.R.T. goal process to see whether the goals you have in mind are well-aligned for who you are. Start to make this a habit. I also encourage you to check in with yourself in 6 months to see what progress has been made. Just imagine what we can achieve if we invest in the time to goal set just a little more! This entry was posted in Uncategorized and tagged #goalsetting, #JLLB, #smartgoals, #theconfidencepost. Bookmark the permalink.